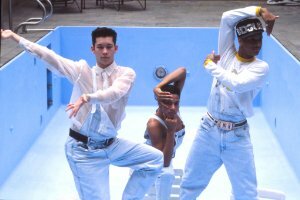 About Madonna's dancers on 1990 Blonde ambition tour and in the 1991 movie In bed with Madonna. Reveals some heartbreaking backstage stories about real people that remained untold. Thanks for posting about this film! I wouldn't have heard about it, and now I hope it comes to a city near me. (The Amazon links got my hopes up -- one goes to the TV show "She's Got the Look" and the other to another "Strike a Pose" film which may or may not be an adult film). I went to see it earlier today. It's a well made documentary and the stories of the mens' lives are very interesting but it is quite a sad film also. It did make me realise what a great piece of activism Madonna's Blonde ambition tour and the Truth or Dare documentary were. I remember the controversy at the time although compared to today what was shown on stage and in the film are quite tame, which I guess speaks to how boundary breaking it was for her to use her mainstream ubiquity to attempt to normalise attitudes towards gay people and HIV. It came at some cost to those involved though. Which is not to blame Madonna but to recognise that being part of that mega tour, at such a young age, and then landing back in the real world, while your community was being ravaged by HIV and aids was always going to be tough. The film did well at showing the threads of their lives and they are all still fantastic dancers. Definitely worth a watch. This looks terrific - does anyone know what the song in the trailer is? Found it! HAEVN - Fortitude.